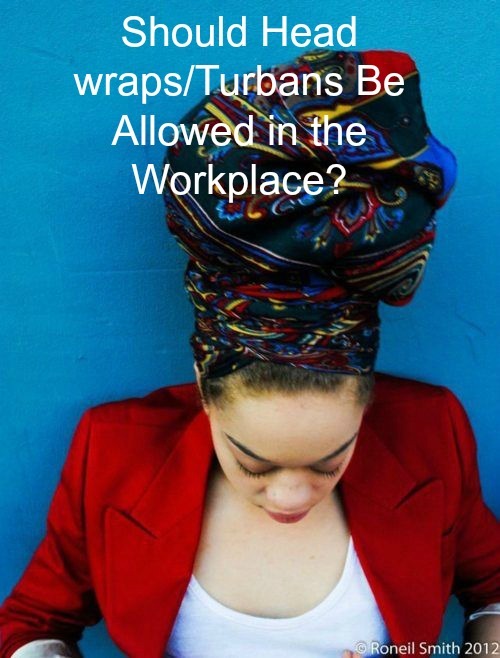 Are Headwraps Appropriate for the Workplace? Many of us naturals have struggled with the way our hair should be worn in the workplace, but what about head wraps and turbans? Is there an appropriate way to wear them or should they even be allowed in the office at all? I’ll be the first to admit that I was against this whole idea of head wraps in the office, unless it carried a religious meaning. Actually, I wasn’t even really excited, at first, to be writing this article since I had such a strong opinion about it being prohibited. The reason behind my initial opinion was it would just make things a bit more complicated and open the door for other articles of clothing to be considered, cultural or otherwise. If workplaces started permitting head wraps and turbans, would that then mean people could wear hats and beanies too? Hats are for fashion/style (and covering bad hair days) and a lot of people wear turbans and head wraps as a fashionable piece as well, not just for cultural purposes. What about hair bonnets and scarves or dramatic fascinators? Yes, these were all the questions that went through my mind. I decided that I needed opinions from others though so I could try and keep an objective viewpoint. I posed the question in my group chat and the response was 50/50. Two of my friends were for head wraps/turbans in the office and the other two were against it. The two who were for it pretty much gave the same reasons I did above. They agreed that if it wasn’t a cultural obligation, they should not be allowed. One of the two who were in favor said she feels that black/brown people should get some leeway. She admitted that this was a bias reason but also said that it’s not hurting anyone or stopping/slowing down work production so who cares? My other friend feels that Corporate America disparages any and all things Black, therefor banning head wraps in the office. I was still holding on strong to my opinion at this time and then that same friend sent me a text suggesting I include the fact that in the 1800’s, black and multiracial women were ordered to wear head wraps so that we wouldn’t ‘tempt’ white men. I thought that was an interesting fact and, although I didn’t fully understand it, I was intrigued. My friend being the factual person she is, followed up with an article from Black Girl Long Hair (BGLH). The article, was interesting and very enlightening. I never knew that during those times, there was such a “law” in place, BUT the fact I loved the most was that they wanted us to keep our hair in head wraps because we were getting too much attention with our creative and fabulous hairstyles, but that didn’t stop us! We started tying the wraps in elaborate ways which gained even more attention than our hair and in the end, we were STILL fabulous. Can’t stop us! This now brings me to my revised opinion on head wraps/turbans in the workplace. Although I still believe this could open up a new can of worms, I am all for it! After reading that article, I think head wraps show a sense of pride and beauty and how resourceful we can be. Being able to wear our natural hair or rock a beautiful wrap is something to be proud of and feel confident in, in and out of the workplace. It’s expressive and keeps the spirit of those beautiful women before us alive.